Outside the office of Bronx, New York, District Attorney Darcel Clark, a protest rally for Pedro Hernandez this summer began and closed with prayer. Hernandez, 18, had spent 13 months awaiting trial in Rikers Island prison on questionable weapons charges in the shooting of another teenager because his mother couldn’t afford his $255,000 bond. Eventually, the Robert F. Kennedy Human Rights group paid a reduced bond of $100,000. Between the prayers for people unjustly locked in the criminal justice system, those gathered at the rally called on Clark to dismiss the shooting charges. Some local politicians and advocates said the situation was painfully reminiscent of the case against Kalief Browder. Browder spent three years on Rikers Island, two of them in solitary confinement, because he was unable to make $10,000 bail after being charged with stealing a backpack as a 15-year-old. That case was eventually dismissed, but it left Browder a broken man who later took his own life. The Browder case has haunted Clark. The first woman of color to be elected district attorney in her state, she campaigned as a change agent who understood the burdens the criminal justice system imposes on black and brown lives. But in her previous role as a judge, Clark presided over six of Browder’s 31 court dates while he languished in jail — and admitted during her campaign that she couldn’t remember them. Weeks after the rally, Clark’s office dropped the weapons charges while continuing to pursue an unrelated robbery case against Hernandez. DNAInfo reported recently that the prosecutor in the shooting case is being investigated over allegations that he helped coerce people into falsely identifying Hernandez. 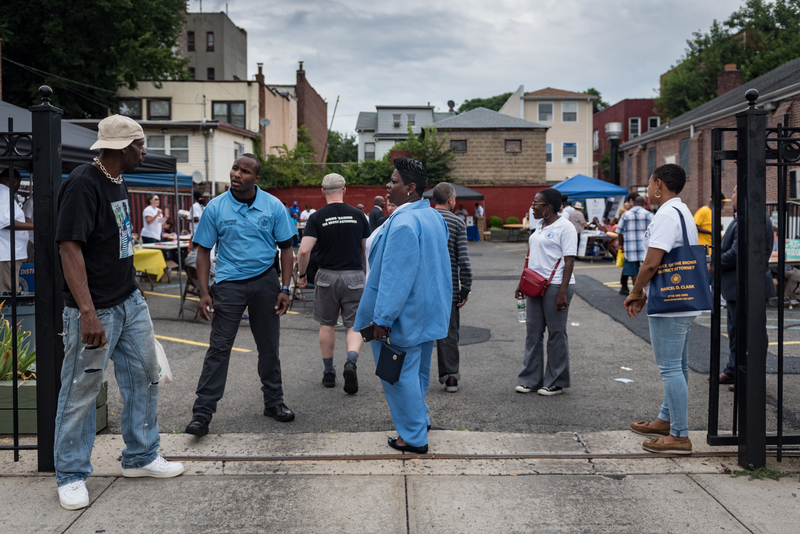 Bronx District Attorney Darcel Clark (center) during the Another Chance event, which allowed participants to resolve outstanding summons warrants, clear their record and attend a resource fair. Numbers have long painted a cruel reality in the Bronx. The borough north of Manhattan is home to 1.5 million people, most of whom are black or Hispanic. More than 8 percent are unemployed, almost double the national average. More than 30 percent live below the poverty line. The South Bronx has the bleak distinction of being the poorest congressional district in the country. Lawyers in its court system routinely handle crimes of poverty, such as subway turnstile jumping. The Bronx also has the highest rate of violent crime in the city and a notorious backlog of felony cases. It’s a system that processes misery day in and day out. Clark came into office promising a new day. “I want to change the narrative of the Bronx,” she told the crowd at a community meeting last December, a few weeks shy of her first year in office. Clark, 55, was elected in November 2015, as national headlines questioned the police-involved deaths of Eric Garner, Sandra Bland and Freddie Gray and the acquittals of the officers involved. She is one of several people of color recently elected as local prosecutors who are vowing to aggressively pursue a reformist vision for the criminal justice system, especially in its interactions with people of color. In Chicago, Cook County State’s Attorney Kimberly Foxx argued as a candidate that prosecutors have a conflict of interest in handling police-involved shootings because they must work regularly with law enforcement. In St. Louis, Circuit Attorney Kim Gardner has said she will work to restore residents’ trust in the criminal justice system and work to divert nonviolent offenders from entering a courtroom. Clark has a 30-year résumé as a former prosecutor, a criminal court judge and an appellate judge. But her election was controversial. Her predecessor, Robert Johnson, held the job for 27 years. After running unopposed in the Democratic primary in 2015, Johnson resigned a few weeks before the general election to seek a judgeship. Critics blasted the move as politically corrupt, saying it essentially allowed the Democratic Party machine to handpick the next district attorney: Clark. In the Bronx, Democrats outnumber Republicans by more than 12 to 1. In the general election, Clark won 85 percent of the vote, easily beating Republican Robert Siano. With the party registration numbers so lopsided, insiders say Clark can be district attorney for as long as she wants. During the campaign, Clark said she would push the office to be more effective, cut the colossal backlog and build a stronger relationship with residents who distrust the legal system. Clark said she would send prosecutors into neighborhoods to hear firsthand the concerns of residents and work with them to prevent crime, particularly gun violence. “A 21st-century prosecutor is not just about prosecuting cases, you know, having people arrested and locked up and throw away the key. We are here to service the entire community,” Clark said in an interview earlier this year. That includes defendants as well as victims, she said. “Criminal justice includes all of the community,” said Clark, “and as a prosecutor, I have to see myself in that way. Some say she’s not doing it fast enough, though, and question how much Clark can truly reform a system in which she was a longtime cog. Clark has been in office less than two years, arguably not enough time to judge her office’s results. But others are hopeful about Clark’s ability to bring change. 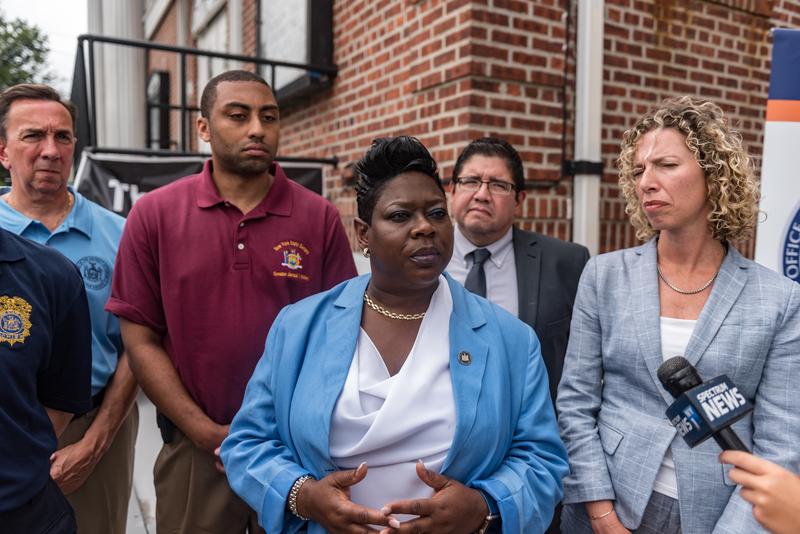 Bronx District Attorney Darcel Clark (center) during a news conference during the Another Chance event sponsored by her office and the Bronx Defenders. She still lives in the Bronx with her husband, Eaton “Ray” Davis, a detective and 30-plus-year veteran of the New York City Police Department. His perspective deepens her understanding of the police, she said. After Clark graduated from Boston College in 1983, and from Howard University Law School in 1986, she was hired as an assistant district attorney in the Bronx. She spent 13 years in the office, was supervisor of the narcotics bureau and later deputy chief of the criminal court bureau. In 1999, then-Mayor Rudy Giuliani appointed Clark as a judge in criminal court. In 2006, she was elected to the Supreme Court in Bronx County, the trial-level court in the state’s system. In 2012, then-Gov. Andrew Cuomo appointed her to be an appellate judge covering Bronx and New York counties. Clark stepped down from the bench in 2015 to run for district attorney. Clark is described by colleagues as laser-focused, a clear thinker and down-to-earth, as well as someone who possesses a holistic understanding of what works and what doesn’t work in the criminal justice system. With a 2017 budget of $71.6 million, Clark began hiring, adding new prosecutors, for a total staff of more than 850 people. There is no reason that her office should not be ready for trial, she said. “And if there is, we need to take that in account as to what our approach is going to be on those cases.” Clark said she meets with her staff weekly to review upcoming cases and the oldest cases to determine whether they are still viable. Those measures have cut the backlog from more than 15,000 pending cases at the end of 2015 to just over 11,000 at the end of 2016. Clark shifted the office to a vertical prosecution model in order to cut delays and build accountability. That means one assistant district attorney handles a case from beginning to end, from charge to disposition, instead of cases being handed off to other assistant district attorneys at various stages. Clark opened a 14-person bureau on Rikers Island that includes investigators, administrators and prosecutors to work on cases against inmates and correctional officers. Clark also created a conviction integrity unit. One of its first cases involved Steven Odiase, 31, who was sentenced to 25 years to life in 2013 for the killing of 15-year-old Juan Jerez. Odiase’s attorneys later came across a redacted police report in evidence that the district attorney’s office had turned over. Blacked out was a witness’s description of Jerez’s killer that did not match Odiase, said Odiase’s attorney Pierre Sussman, who alerted Clark’s office. Prosecutors then asked for Odiase’s conviction to be vacated. In April, he was released from prison, and Clark announced last week that he will not be retried. Clark’s time as district attorney so far shows the complexities and contradictions of her role. At the community meeting in December, many residents voiced concerns about policing and police brutality. Clark assured them, “If the police want to run wild, they have to come through me.” Many applauded, but one man stood up and challenged her. Even if her office brought charges against a police officer, he said, Clark had little to no sway over a conviction. Some applauded in agreement. “I’ve had to work side by side with the police. We need the police. You know, people say they don’t like the police until they need them.” Still, Clark pointed out, the Police Department in New York and others throughout the country also need reform. “How many times are the courts going to dismiss cases?” Clark said. “How many times are there going to be federal monitors on a police department? How many times is a judge going to declare that the tactics of the police are unconstitutional? Last year, Clark confronted the shooting death of Deborah Danner, 66, by a police officer. Emergency crews and police officers had come to Danner’s seventh-floor apartment in the Castle Hill neighborhood on Oct. 18, 2016, in response to a 911 call about an emotionally disturbed woman screaming in the hallway. Danner allegedly refused to go to the hospital. At some point, she held a pair of scissors, then swung a wooden bat toward Sgt. Hugh Barry. Barry opened fire, shooting Danner twice. The mayor and police commissioner both criticized Barry, saying he should have used a stun gun instead of his gun. But the state attorney general, who has the power to investigate police shootings of unarmed people, declined to proceed, stating that Danner was armed when Barry shot her. In response, Clark impaneled a special grand jury to hear evidence in the case. In May, seven months after Danner was shot, Barry, 31, was indicted for second-degree murder, manslaughter and other charges in the killing of Danner. The grand jury found that Barry should have used other ways to subdue Danner or should have waited for a specialized emergency service unit to arrive before he used deadly force. He was released on $100,000 bond. His next court date is Nov. 27. In a statement, Clark offered her condolences to the Danner family and acknowledged “the heartbreaking loss they have suffered.” She also thanked them for their patience. 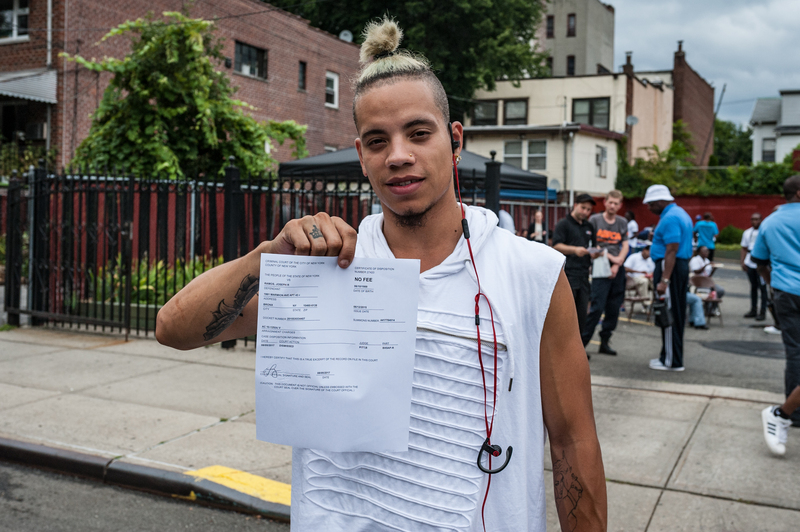 Joseph Ramos cleared a warrant for an open container, a summons he received on his birthday, during the Another Chance event, where participants can resolve outstanding summons warrants, clear their record and attend a resource fair. Organizations such as the Legal Aid Society have been pressuring Clark and other borough prosecutors to stop pursuing low-level crimes such as subway fare evasion and possession of small amounts of marijuana. Black and Hispanic New Yorkers are disproportionately targeted for such violations, advocates say. Over the summer, Clark held a second Another Chance event as part of an effort to address the concerns. In the first event, held during her first year as district attorney, she partnered with public defenders and judges to bring a warrant forgiveness program to the Bronx. In a makeshift courtroom at Mount Hope Community Center, 270 people had 355 summons warrants erased, many for offenses such as public alcohol consumption, disorderly conduct or possessing a small amount of marijuana. Because these offenses are handled in criminal court, convictions can prevent people from getting housing, employment and immigration visas. During the event in August, held in the basement of Eastchester Presbyterian Church, a few men sat in metal folding chairs waiting for their cases to be called. In case after case, the summons was for having an open container of alcohol on the street. Bobby Diago, 56, had eight summonses, the oldest from 2011. After his case was called, the judge vacated his warrants in a matter of seconds. By noon, more than 100 warrants were dismissed. It was “a drop in the bucket,” Clark said, compared with the 355,000 open summonses in the Bronx and the 1.5 million throughout the city. Many of them, Clark admitted, could not be tried. Standing outside the church and holding his disposition certificate, Diago, a construction worker, said that he had not taken the summonses too seriously (“What, they gonna give me life for an open container?” he said), until his wife told him a police officer had come to their home looking for him. Clark said outside the church that more of such offenses are being moved to civil court from criminal court. “We’re doing anything that we can to try to keep people out of the criminal justice system and provide them with resources so that they can be stable and really be productive members of the community,” she said. Another certificate holder, Joseph Ramos, remembered the date of his summons clearly — it was his 26th birthday, June 12, 2015. The whole block in his Bronx neighborhood was seemingly outside celebrating with him, Ramos recalled. “The cops came and gave everybody tickets,” according to Ramos, who said he works as a security guard. One officer, Ramos said, took the plastic bottle Ramos had in his hand and poured its contents, an almost full bottle of Hennessy, onto the ground. The Bronx court system still runs on delays. On any given day, a long line of defendants with court appearances snakes out the door and onto the sidewalk. A holding room is filled with those transported from prison, awaiting trial. Judges routinely adjourn cases, attorneys say. “It’s a horror show,” said Sussman, who has been an attorney for more than 20 years. With the Browder case still echoing through the system, Clark says the most challenging aspect of her job has been dealing with youths. Time will tell which case will determine that balance and define Clark’s tenure as district attorney. Kia Gregory, formerly on staff at the New York Times, is a New York City-based journalist whose work has appeared in The New Yorker and The Atlantic.